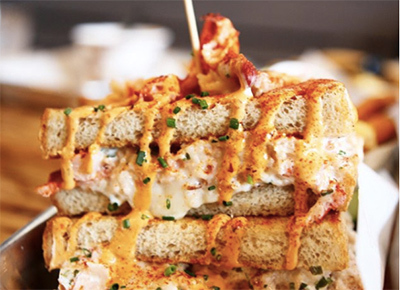 NEXT ARTICLEBibs Up: These Are the 18 Best Lobster Dishes in the U.S. It's 3 p.m., you're sitting at your desk, watching the hands on the clock move at a glacial pace and listening to the sound of your stomach rumbling. You need a snack, but you don't want anything that'll make you feel gross. Instead, stock up on these nine options, all of which are as delicious as they are nutritious. All too often, packaged yogurts are loaded with added sugar, preservatives and other less than healthy ingredients. Skyr, on the other hand, is an Icelandic cultured dairy product that has the consistency of regular yogurt but with a milder flavor. Siggi's skyr comes in lots of delicious flavors (think: nectarine, coconut and lingonberry strawberry) and contains way less sugar than similar products plus a bunch of live active cultures, which promote digestive health. Popcorn has long been one of our go-tos for a fairly harmless midday snack. The Little Kernel makes it even more acceptable to munch on a few handfuls. Popped in olive oil, these little guys (which come in six flavors like pink Himalayan salt, white cheddar and truffle sea salt) are gluten-free, non-GMO, dairy-free, kosher and made with whole wheat. A delightful mix of oats, organic quinoa, amaranth and flax, this superfood blend from Purely Elizabeth packs nine grams of protein and seven grams of fiber. Oatmeal: It's not just for breakfast anymore. Gas station Slim Jims these are not. EPIC Provisions' savory meat-based superfood bars are made with the highest quality grass-fed meat available, are full of protein and are free of grains, gluten, soy and dairy. In a variety of flavors like Chicken Sesame BBQ, Bison Bacon Cranberry and Beef Apple Bacon, each bar clocks in at under 200 calories and will keep you full until dinner. You really want chips, but not all the added bad stuff that often accompanies them. Instead, reach for a few crispy and savory seaweed snacks from gimMe. They're super low calorie, meaning you don't have to feel guilty about eating an entire pack in one sitting. Stash a few packets of Justin's nut butter and you're pretty much set, snack-wise. In almost ten flavors, these taste just as good on their own as they do spread over an apple or rice cake. Plus, each packet has seven grams of protein, three grams of fiber and contains just a few super-simple ingredients. Pretend you're on an island vacation even when you're just trudging through another work day with Dang's simple and satisfying coconut chips, which are made with just three ingredients (coconut, cane sugar and salt). With as much fiber and less sugar than an apple, they're a subtly sweet something to munch on when mid-afternoon hunger pangs strike. Sometimes we can satisfy our chocolate craving with a piece of super-sweet fruit, but other times we can't. Those times, we reach of Unreal's dark chocolate peanut butter cups, which are vegan, non-GMO and made with sustainably sourced ingredients.